The majority of people experience bad breath at one time or another. In many instances, eating foods containing garlic or onions causes the problem. Using tobacco products also causes an unpleasant odor. 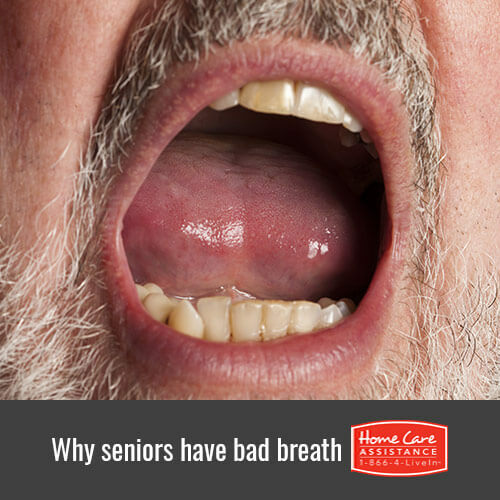 However, Rhode Island elderly care providers believe there are other common reasons why seniors might develop halitosis. Seniors who do not brush and floss their teeth at least once a day allow food particles to linger in the mouth, which serve as a food source for harmful bacteria. The bacteria breakdown the food and increase in number. As the food deteriorates and the bacteria increase in number, a foul odor develops. When bacteria, viruses and yeast cause sinus, respiratory or oral infections, the microbes release toxins. The immune system intervenes and the combined actions cause unpleasant odors that travel up to the mouth. Seniors suffering from gastroesophageal reflux disease or GERD commonly have bad breath. The disorder causes stomach contents to rise into the throat, which includes the malodorous gas that develops during digestion. The odor then releases into the mouth causing sour breath. Some people have cavernous openings along their tonsils that resemble Swiss cheese. Over time, food becomes trapped and accumulates in the openings, which forms solid masses called tonsil stones or tonsilloliths. Bacteria congregate to the area and feed on the food, resulting in an unpleasant odor. Antihistamine and diuretic medications are designed to dry secretions or eliminate fluid. These actions cause a drying of the oral cavity. Without saliva to wash away food particles and inhibit bacterial growth, bad breath develops. The condition often occurs in adults who wear dentures and fail to perform proper oral hygiene. The warm, moist environment beneath upper and lower dentures provides an ideal breeding ground for bacterial or yeast growth. The gums become reddened, swollen and an odor develops. Help your loved one maintain dental and oral health with Home Care Assistance of Rhode Island. Our reliable stroke, dementia, and Alzheimer’s caregivers in Rhode Island are highly trained to help seniors of varying abilities accomplish daily tasks including personal care tasks like bathing and dressing. Call us at (401) 284-0979 today to learn more about our services and set up a complimentary consultation.